125 miles and 77 portages - "The best way to spend Easter"
Sol Sollerer (L) and Coleman Ruiz (R) powering to a win in a Longhaul - Devizes to Westminster Race 2013 in 25:11:21 - the quickest time since 1996. 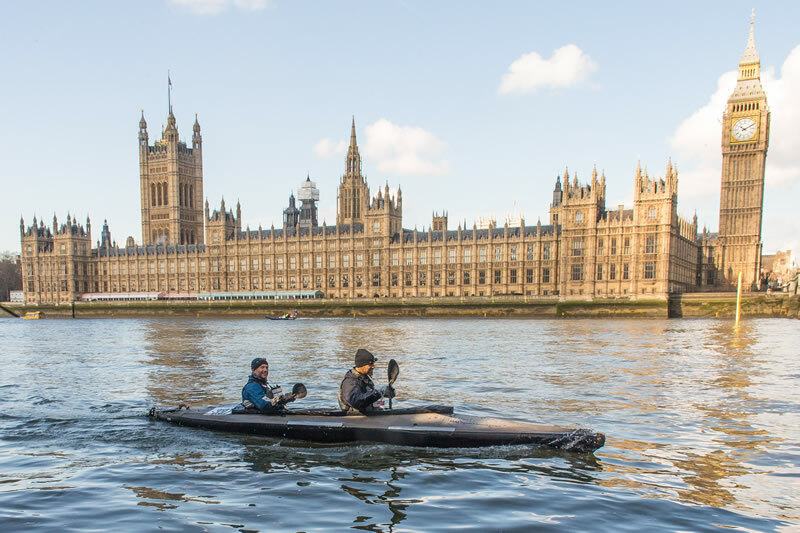 The purpose of this page is to create a greater awareness of the existence of and general information about folding kayaks in the history of the DW. We have listed the brand / model boat that we know was used for a particular race - any unlisted boats were most likely to have been Tyne SD17 (up to around the 1970's) or the heavier military issued NATO Klepper Aerius II (520). The race is 125 miles long and has 77 portages. The first 52 miles are along the Kennet and Avon Canal to Reading, the next 55 miles are on the River Thames to Teddington. The final 17 mile section is on the tidal portion of the Thames. Within the Senior Doubles (non-stop straight through) category of the Devizes to Westminster kayak / canoe marathon, there are several sub-classes of trophies that are awarded to specific classes of paddlers - EG Army, Navy, RAF, University, Scouts, Civilian, etc. A sub-class called the Tyne was officially started in 1951 and this class covered folding kayaks. This Tyne Trophy continued until 1970 when the trophy unfortunately went missing / lost. The DW committee at that time decided not to replace the trophy and this sub-class then became un-official from that time onwards. Since then, some kayak crews still continued to race in folding kayaks as they could still win in other classes - EG Army. Most of the crews participating in the folding boat Tyne Class over the years were from units such as the Royal Marines Reserve and the Artists Rifles, with the un-official record set by Richard Spinks / G Ridgley of the Artist Rifles, in 1994 with a time of 22:26:34 in a Klepper Aquilus. The original Tyne Trophy was donated by the Tyne Folding Boat Ltd, an England based company that produced folding kayaks between 1935 and 1975. Tyne kayaks were used to cross the English Channel as early as 1937 and the the military version kayaks (EG Cockleshells) were also used during WWII, worldwide. A 1965 Tyne catalogue states that the double seater Tyne Sports 17ft model kayak won the DW race 12 times between 1951 and 1965. The DW race was not mentioned in subsequent Tyne catalogues so it is not certain which make of folding kayak won races since then - unfortunately the DW race results do not list actual kayak models used, however it is well known that after 1965, that various Klepper model kayaks took part, mostly the NATO military issue version Klepper Aerius II. The DW Committee decided to officially re-instate the folding boat class, starting with the 2013 DW race. 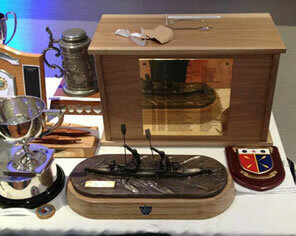 A new replacement Folding Boat trophy was kindly donated in time for this 2013 race, by the Artist Rifles Association. There is a separate Junior Class - double seaters over 4 days, for those who do not want to do or cannot do the non-stop Seniors Class. A Royal Marines Trophy for the fastest folding boat in the Junior Class was available and has not been awarded since 1967. The Endeavour class is a non-competitive doubles class held over 4 days - it is not known if any folding kayaks has successfully completed in this class. This lovely trophy has its own cabinet, shown in the background. The trophy's cabinet has a plaque listing the previous winners of the Folding Boat class. The below historic information was extracted from the http://www.canoeraceresults.co.uk/ site. Please let us know of any omissions, errors, etc. It must be remembered that comparison between years is subject to different race conditions. Over the years not only have there been a variety of river and weather conditions but also the race rules have changed from a position of no support being allowed to the present concerns for health and safety and risk analysis. In addition the course itself has changed in both routes over portages as well as canal depth and upkeep. Please remember that these tables do not provide a judgment on ability. One of the biggest challenges with this race is choosing the best starting time so that the tidal Thames section is paddled during the receeding high tide. Over the last 5 years (2012-6), only one leading boat did not have to wait at Teddington (4th placed 401 in 2016). Most of the top finishing boats would have got far better times if the crews did not have to wait hours for the tide to change! Finally, in 2017 the leading boat passed through Teddington 1 hour after high tide followed by 4 boats, two of which had just beat the tide cut-off only to be forced off the river to walk the rest of the way! (cannot paddle against the incoming tide). 397 4 32:06:21 Sykes, Ben "Cockleshell Endeavour"
395 10 39:14:36 Marshall, Neil "Cockleshell Endeavour"
405 Retired Trollope, Andrew "Cockleshell Endeavour"
Spinks R H - Artist Rifles - 6 times. 1984, 88, 89, 91, 92, & 94. A folding boat trophy was first claimed to have been awarded in 1951. Although more commonly known as folding boats they were also described as rubber collapsible canoes in some early years. An advertisement by Tyne Folding Boats of Twickenham placed in 1961 claims their Sports 2 seater won the subclass in 10 of the 11 races from 1951 to 1961 and so it was that the Tyne company offered the Tyne Challenge Cup. A folding boat was only to be the outright winner of the event in two years, in 1951 and 1953, but it was a folding boat crewed by Dansie & Dry representing the 21st Special Air Service that led the field in 1951 and who with several other crews turned the event into a 24 hour non stop race taking over 10 hours off the record. It was not until 1959 that their time of 24 hours 7 minutes was bettered although it should be noted that the was in full flood and during the night one crew is reported to have strayed off course and paddled through the goal posts of a football field before finding the main course of the river again. Many felt the event should not become a race. In 1954 Canoe Camper reported that racing boats were to be banned from the event. In the end it was the folding boats that were dropped from the order of battle when in 1970 the trophy was lost and the subclass was eliminated. As happens from time to time a group of competitors refused to let the class die and continued to use folding boats in the event to the present day. While there is no record of a folding boat between 1970 and 1984, 53 folding boats have completed the event since 1984 with 9 boats in 1997 alone. While it seems unlikely that many competitors would be interested in these heavy boats weighing about 30 kg many of the DW subclasses have few competitors. Perhaps the most endearing feature of DW is an ability to welcome all comers and let the occasional paddler have a go with the best in the world. Over the years the race has attracted several Olympic medal winners but they seem to have faired no better than the occasional paddlers in this, the most taxing of endurance events. One might ask why make a difficult task harder than it needs to be and use a slow heavy boat. However one intrepid competitor, Richard Spinks of the Artist's Rifles, entered the 1000 mile club (for those who have completed the race 8 times) using a Klepper and with G C Ridgley is the present unofficial class record holder with a time of 22:26:24 set in 1994 with a good flow of about 140 cubic meters/second. The original record having been set in 1961 by W Poxon and A Howell of 22 SAS in a time of 23:26. Of the 78 crews recorded as having completed the event in a folding boat only 3 have ever finished in less than 24 hours. The time set by Dansie and Dry in 1951 has only been bettered by those three crews despite rule changes which have permitted bank support for over 40 years and a restored canal. So it is that the paddlers of folding boats, who with others in 1951, turned a camping trip into a non stop race over half a century ago have now accepted an offer to present a new trophy for folding boats. 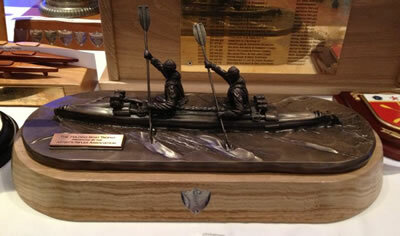 The new trophy, kindly donated by the Artist's Rifles Association, shows an Operational Canoe Team made famous by Blondie Hasler with his partner Bill Sparks in Operation Frankton; the raid by Royal Marines on Bordeaux which took place in December 1942 and which inspired the film the Cockleshell Heroes. Paddlers will be aware that the BCU Hasler Race Series is named after the leader of the raid and the Bill Sparks Trophy is awarded to the highest placed veteran K2 at the Halser Final.